Opening Times: Mon-Sun 0830-2300. 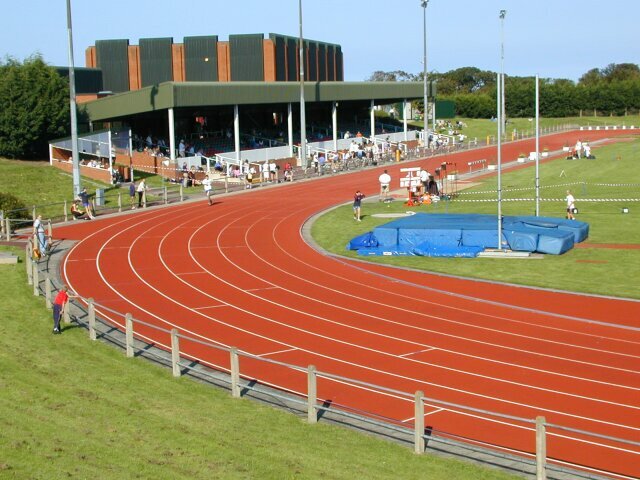 The track is however often booked for other purposes so it is best to ring in advance. Field Event Facilities: Full - 1 HJ, 1 PV (1L-SE), 2 LJ/TJ (2 1L-SE), 3 SP, 2 DT/HT (2 1C-INT), 2 JT. There is also 1 SP (EXT, no board), 1 DT (1C-EXT, cage broken). Seating: 941 covered. There is also uncovered terracing down the back straight. The track was originally cinder and was reopened as a synthetic one by Lynn Davies on 7th May 1989. The adjacent leisure centre opened on 12th May 1981.